This one I had only just finished and was to be a class sample - class has been cancelled until I can remake it. I decided to tell about this incredibly disappointing ''experience'' for one reason only, just in case anyone out there happens to see them. I am truly amazed that someone who has visited my shop, and therefore, must also love to stitch and create, can steal the creations of another. I very much doubt that that person will be reading this, but if by chance you are, shame on you! Moving on .... I have some lovely work to show you. Sheila has been stitching ''Journey of a Quilter'', which is one of Leanne Beasleys fabulous quilts. What do you think of these blocks - beautiful aren't they. And Debbie has started the block of the month quilt in the Homespun magazine, the one that several designers have contributed a block, all in pinks. This, too, is so beautiful. I did get the last Christmas redwork block finished and have joined all the blocks, but just waiting on inspiration for the final border. Then Rosalie Quinlan's gorgeous pattern, Little Patchwork Village, turned up in the mail. Well, who could resist. I have been inspired to do a little cross-stitch again, after seeing some amazing work on some of my favourite blogs. After a thorough search of the ''sewing room'' I found some patterns that I bought many years ago, in Australia. 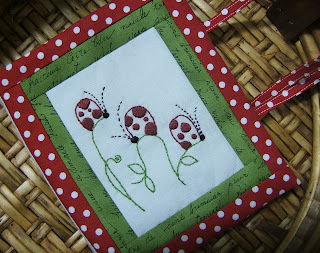 I always knew I would get round to stitching them one day, and this is the first of them. I had forgotten how wonderfully relaxing cross-stitch is, even if it does take a little longer that stitchery. I am looking forward to Waitangi Day holiday tomorrow - I think my son has a mountain biking expedition planned so I hope the sun is shining! Wow, thats terrible, I'm so sorry for you. Hopefully another crafty person will spot them somewhere (fingers crossed). That's awful. Hope your lovely pieces are returned. You have a lovely blog .. lots of beautiful things to see. I have saved you in my feeds. Shame on the person that stole your creations, but can you blame them for wanting them? - they are just so cute, especially that ladybug. You have a wonderful blog and I am always drooling over the beautiful pieces that you showcase. I can hardly believe what happened to you. Good of you to move on and show us those lovely projects! The redwork is very pretty. And Leanne's quilt is gorgeous. I definitely want to make something by her, once I finished many many WISPS! I hope the person or persons who took those craft items get "Stitchers Karma".At the quilt shop where I work we had a small miniature quilt stolen that a lady had lent to us. She put months of work into it. It has never been found.The blog world will look out for your items.